Our leadership staff has 150+ years in molding experience. SPI can meet any of your custom blow molding needs with a variety of plastics including HDPE, ABS, polycarbonate, and TPE. SPI’s Molding technology consists of family molds, insert molding, multi-cavity and trapped air molding. Our facility is equipped with three dual head presses and ten single head presses ranging in tonnage from five tons to 200 tons of clamp force and has shot capacities ranging from 1.0 # to 42 #. Materials – SPI- Blow Molding Materials: We understand choosing a material for your project can be overwhelming as the possibilities are endless. SPI works hard to ensure we are up to date on the latest material science and offers effective solutions for our customers material selection for their product sustainability and success. We put the ‘custom’ into Custom Blow Molding. We design specialty trim and drill fixtures to ensure your parts can be made to exacting specifications. CNC – SPI manages many different trim and drill methods. 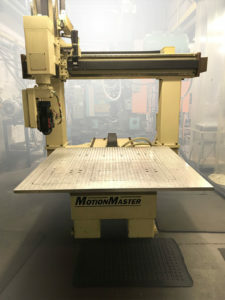 One of the most common methods is through the use of the Motion Master 5 Axis CNC 8055M with a trimming window 48x54x32. CNC routers are automated cutting solutions aimed at accelerating the output of manufacturing processes while enhancing the product quality. 5-axis machining provides infinite possibilities as to the part sizes and shapes you can effectively produce. The term “5-axis” refers to the number of directions in which the cutting tool can move. On a 5-axis machining center, the cutting tool moves across the X, Y and Z linear axes as well as rotates on the A and B axes to approach the workpiece from any direction. In other words, you can process five sides of a part in a single setup. When used in tandem with advanced design software, CNC machines can create outputs that cannot be replicated by manual machines. Our quality standards meet the ISO-9001-2015 requirements to ensure our customers get the best quality parts they deserve. We firmly believe that everyone is responsible for quality, from the engineer who designs the tools, to the operator who molds the part, to the quality auditor who inspects the finished part. We are committed to continuous improvement practices to ensure we exceed our customer expectations in every aspect of the manufacturing process. Quality Parts- On Time- At a Fair Price. 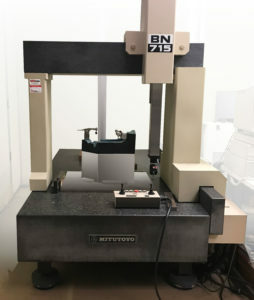 CMM – SPI uses a Coordinate measuring machine CMM Mitutoyo BN715, to identify different types of measurements including dimensional, profile, angularity, depth mapping, and shaft measurements to ensure precision and accuracy in every part we produce. CMMs are comprised of three main components: the machine itself, the measuring probe, and the control or computing system with appropriate measuring software. After placing a workpiece on the machine table, a probe is used to measure different points on it by mapping the x, y, z coordinates. The probe operates manually via an operator. These points are then uploaded to a computer interface where they are analyzed using modeling software and regression algorithms for further development. As a full-service blow molder, we provide a broad range of product assembly services to our clients. We can source components, add decals and instructions sheets, plus assemble products per our customer’s requirements. Assembly services can also include full product pack-out capabilities. Our full product pack-out service involves packaging assembled components, including custom hardware, into retail packaging which can be directly drop shipped. Let us know your special-order fulfillment requirements and we’ll work with your budget and timeline. We will solve your most difficult design/molding issues. Utilize the “contact us” menu to quickly get an answer!